Originally from London, I moved to Poland to absorb as much of the culture as humanly posssible. Maybe the biggest influence on me has been the food and I credit my adopted babcia, (Polish for grandmother) Ania, with much of the information here. I lived in Zielona Gora and Szklarska Poreba which are in the west and south-west of Poland respectively. 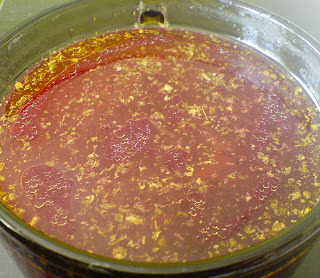 This deep red soup is believed to have originated in what is now Ukraine and there is many varieties throughout Central and Eastern Europe, Borshch being a famous Russian form. The main ingredient of this delicious soup is beetroot, garlic and sometimes potato. As with most soups here it can be eaten as a main meal or strained, to be drunk with krokiet for example. Barszcz can also contain dumplings called uszka. These dumplings usually have a mushroom filling. 1. Peel and chop beetroot roughly into chunks any size you want. I usually do them the size of large dice. 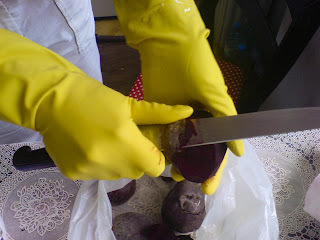 Use gloves as beetroot stains your hands! If you want potato, skin and cut it like the beetroot. 2. Add to soup stock (See 'Making a soup stock). 4. Cover and boil until the beetroot and potato are soft. (Approximately 1 hour depending on size but increasing the length of time increases softness. 5. 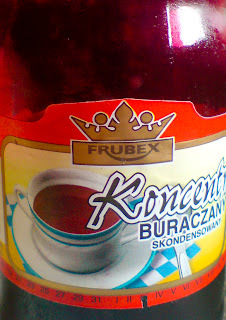 Add beetroot concentrate, either home-made (sorry must wait for link) or ready made from the Polski sklep (Polish shop). Here is an example of one below. Add about a 1/4 litre and taste. This is sweet so taste as you go and if it is too sweet for you, lessen the sweetness using lemon juice. 6. Add herbs (My babcja adds marjoram, majeranek in Polish. I have never heard of this herb until I came to Poland. It is from the same family as oregano but sweeter and used a lot in sausage making here and in Germany). There it is. Extremely simple and quick. 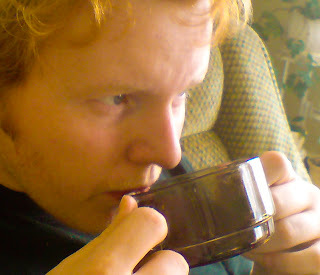 Here I am enjoying strained barszcz after eating krokiet. Authour should actually be spelt author. Right, and being so accurate and all, the Russian counterpart for barszcz apparently is borsh (and not borshch). You can see it from the cyrylica letters, as well as hear the spoken example. Anyway, keep up the good job, mate! I love barszcz with uszka!!!!!!!!! My mum makes the best barszcz czerwony!!! I will edit and update thanks. If anybody has any recipes they would like to share why not email me and I will put them up. With photos would be an added bonus. my mum used to make the soup with the stems and leaves of the beetroot chopped up finely, and then served with small cubes of plain cooked potato dropped in and some soured cream on top. A heart warming soup, more like a meal. I wonder if this is what I've heard referred to as "Red Soup." Its certainly the correct color. No Polish connections. Went there on holiday last month, travelled all over and loved the food. Since coming back to UK have tried a few recipes and doing this one today. I hope it turns out as tasaty as the one I tried in Poland. Actually @januhhh if you look closely enough you can see the Cyrillic letter at the end has a flick at the bottom, which means it's "shch"
Expat or looking to relocate in Poland?